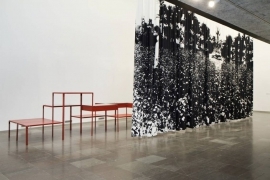 Chisenhale Gallery, The Showroom and Studio Voltaire reveal how their artistic and research ethos will lead the way for their fundraising priorities in their joint, Catalyst fund-supported project, How to work together. In her 2009 book, Ground Control, journalist Anna Minton explores the erosion of public space in 21st century Britain. Looking at the phenomenon of gated communities, private security and a growing emphasis on health and safety, she concludes that a policy for public space that encourages individual responsibility could readdress the inequalities that have arisen. In doing so, she introduces the idea of ‘shared space’, borrowed from radical traffic planning – essentially the idea that if there are fewer restrictions, then each individual takes greater responsibility for their actions. Minton has continued these ideas in a follow-up essay for Think Tank, the online library and research base for How to work together, a collaborative research and commissioning programme instigated by Chisenhale Gallery, The Showroom and Studio Voltaire. Minton has responded to the title of the galleries’ collaborative project by exploring ideas around the ‘common good’ – ideas such as civil rights and economic equality. As the inaugural research paper for the project, Minton’s essay is also a statement from the three galleries about the kind of questions they want to explore when considering their own sustainability and future philanthropic fundraising options. How to work together is the artistic and intellectual programme of a three-year Catalyst-funded project that will see the three organisations develop greater knowledge and capacity for fundraising. Drawing on each other’s contacts and expertise, the three organisations have used the £210,000 funding – part of the 2012 round of grants jointly offered by DCMS, Arts Council England and The Heritage Lottery Foundation, aimed at boosting philanthropic giving to the arts – to bring in one-year grants from Bloomberg, Outset and Jerwood. These will fund the first year of the programme; the intention is to go outside the sector for the following two years of activities. The question of positioning is what binds the capacity building and artistic programme together. A core of critical thinking on Think Tank will enable a range of artistic and intellectual responses to feed through, and the three organisations are looking to create a sustainable structure that complements their critical positioning. Exhibitions resulting from the firsy year’s three commissions will open at each venue in May, around the same time that the next three artists for the following year will be announced. 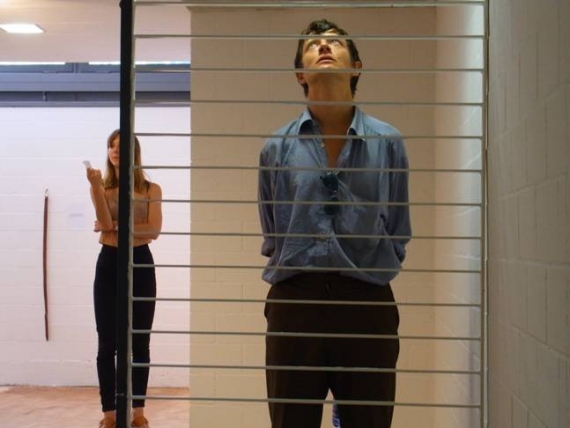 Céline Condorelli, whose initial training as an architect informs her interactive spaces, is working with Chisenhale Gallery where she is exploring support structures, particularly the relationship between friendship and work. A conversation between the artist and sociologist Avery F Gordon can already be found on the How to work together site. Studio Voltaire’s commissioning of Ella Kruglyanskaya, a painter exploring female sexuality and relationships, is perhaps the most surprising within the context of How to work together’s overall aims. 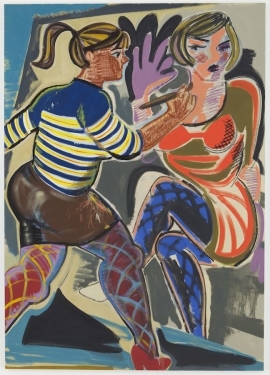 Yet the recurrent theme of ‘frenemies’ within her vibrant canvases could perhaps be seen as a metaphor for the relationships many peer organisations have to navigate in an art world that constantly moves between competition and cooperation. It’s also a clear confirmation that, however much the Catalyst fund may be about philanthropic giving, the three galleries are firmly lead by artistic concerns. At The Showroom, Berlin-based Australian artist Gerry Bibby is working on his first novel with a series of Europe-wide residencies initiated through the Netherlands-based organisation, If I Can’t Dance I Don’t Want To Be Part Of Your Revolution. During a six-week residency at The Showroom, he will be looking into the ‘apparatus’ of the gallery’s structure, developing new narratives and characters for his novel, and creating a work for his exhibition in May. Following in the tradition of Institutional Critique, Bibby has already asked to see The Showroom’s board papers (“I’m not sure we’re going to let him,” says Pethick) and to meet with their plumber to discuss the heating system. How to work together exhibition dates, including preview: Ella Kruglayanskaya, Studio Voltaire, 10 April – 7 June; Gerry Bibby, The Showroom, 29 April – 21 June; Celine Condorelli, Chisenhale Gallery, 1 May – 22 June.